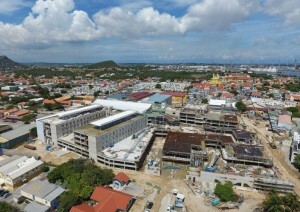 WILLEMSTAD - The construction of the new hospital is going according to the schedule and will continue without any further. This was the promise of the new Minister of Public Health, Nature and Environment Sisline Girigoria. According to a mid-term evaluation, the preliminary final delivery of the new hospital is scheduled for August 13, 2018, almost a year later than originally planned. Then a few months extra is needed to furnish the hospital with medical equipment and inventory.